Bruce and Kate Snyder’s backyard once had an ungainly oil tank, fences, and an exterior stairway. Now the kitchen opens onto a back deck of eastern white cedar. On the left side of the house, there is a breakfast patio. To the right, there is a new entryway addition. A view of the rear of the house, showing the entry off the driveway, which is part of an addition that houses a mudroom, stairs, and an upstairs bathroom. 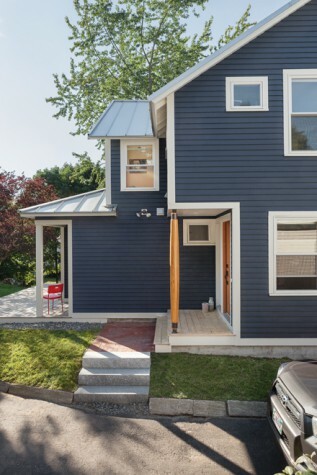 By locating the stairs in this addition, Caleb Johnson Architects and Builders was able to remove two original staircases. This allowed them to create the open plan that Bruce and Kate Snyder wanted. Hanson Woodturning of Cape Porpoise is responsible for the custom-turned column at the entrance. A street view of the house shows a porch that had been previously closed in. 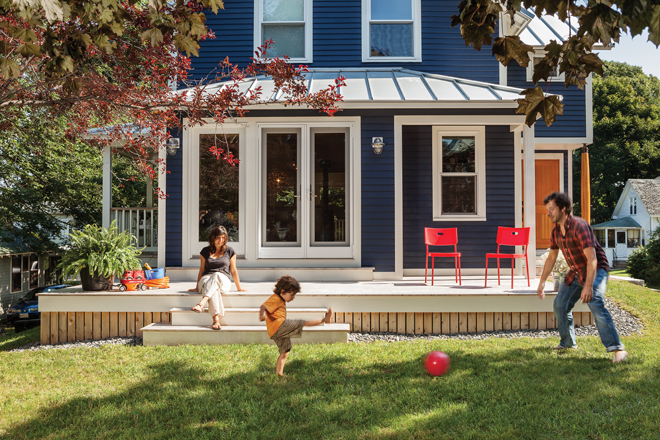 Kate Snyder’s predilection for bold color is evidenced in the blue paint used on the exterior of the home and the orange used for some of the kitchen cabinets. Elsewhere the kitchen makes use of neutrals, like the white subway tile of the backsplash and the gray cabinets in the background. The kitchen island has shelving on the living room side and is topped with an environmentally friendly product called Richlite. The kitchen counters are American walnut. 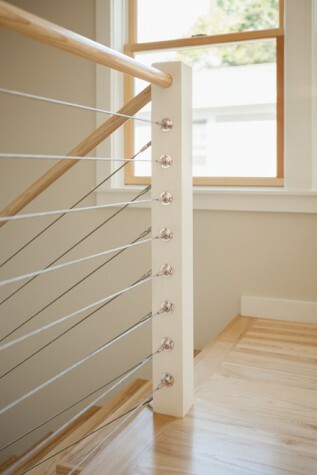 Caleb Johnson Architects and Builders softened the look of the staircase’s modern steelcable railing by using wood handrails and newels. The kitchen has sleek appliances and flat-panel cabinetry with steel pulls, but it doesn’t seem coldly modern, in part because of its antique wood doors and ash flooring. 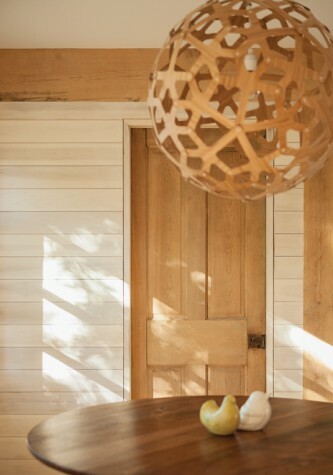 A corner of the kitchen shows an old wooden door acquired from Portland Architectural Salvage, a wall of pickled poplar paneling, a walnut table from furniture maker Gabriel K. Sutton of Biddeford, and a pendant lamp from Design Within Reach. The mudroom’s bench and cubbies are built-in and made of pickled pine. Much about Bruce and Kate Snyder’s current house can be explained by the fact that they once had three dogs. That is to say, they once were the sort of people on whom landlords don’t look kindly. In 2010 they planned to move to Portland from Washington, D.C., but they couldn’t find anyone willing to rent to them because of their pets. At the time, they were looking for a lifestyle change. After considering cities like Asheville, Louisville, and Missoula, they chose Portland for their future residence. They were comfortable with the decision but wanted a year to get the lay of the land before they bought a home. Eventually, someone in South Portland’s Willard Beach area agreed to rent them a place. Over the course of the next year, Bruce and Kate fell in love with the neighborhood. People were friendly. Dogs were allowed on the beach. There were kids with whom their toddler son could play. A great bakery and ice cream store—Scratch and Willard Scoops—were a short walk away. When they were ready to buy, they didn’t want to look anywhere else. “The bakery alone was reason enough to stay,” says Kate. The Snyders looked unsuccessfully for a home to buy. Then they came across a small house in disrepair near Willard Square. It was a one-family that had been subdivided into two apartments. Its front porch had been closed in, and there was an ungainly oil tank, old shed, and exterior staircase at the rear. Rather than feel disappointed, they saw the house’s condition as “an opportunity to go nuts,” as Kate puts it. They could take the house down to the studs and build it back up into exactly what they wanted. Or exactly what they wanted for the moderate size of Willard Square houses. They had only 1,600 square feet to work with. 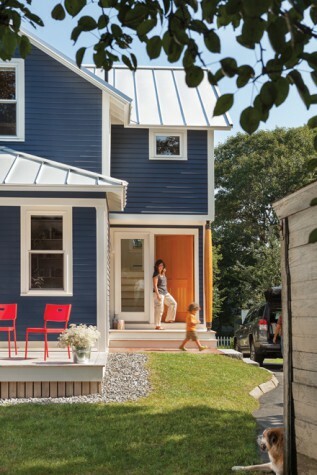 While they were considering possibilities, Bruce and Kate saw an article in Maine Home+Design that mentioned Caleb Johnson, the owner of a Biddeford-based design-build firm who had three young children and had designed an 1,100-square-foot home for his family. “That grabbed me,” Kate says, “that he can fit five people in a tiny house.” Once they met Johnson, the Snyders were all the more convinced that he was the right person for them. “We just jived,” Kate says. “We grew up with spaces that no one ever went into, like formal dining rooms and living rooms,” Kate says. 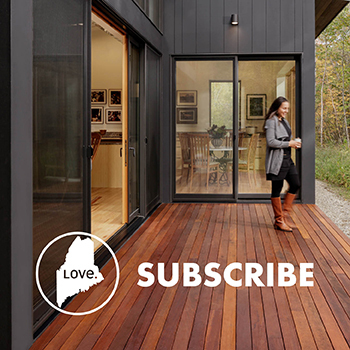 For her own house, she wanted something different: an open, fully functional, environmentally sound structure. Johnson achieved this by designing a ground floor that consists of a single kitchen, living room, and dining room with a small office that can be closed off behind pocket doors. Upstairs, he put three small bedrooms and a landing that can be used as a second office. To execute the design, Johnson reshaped the house. He removed two chimneys and relocated the staircase into a new, two-story entry addition, which houses the mudroom, powder room, mechanical room, and laundry room. The envelope of the building is now so tight that Horizon Residential Energy Services in Portland told the Snyders that it was the second tightest home they’d ever tested. Upstairs an HRV (heat recovery ventilator) prevents that efficiency from becoming a health liability by exchanging one-third of the air in the house every hour. The Snyders eliminated oil altogether and now heat almost exclusively with a Rais woodstove, which is located in the living room and rotates 360 degrees so heat can be directed toward any part of the ground floor. A gas furnace supplies hot water and additional heat. This past winter, a typical monthly gas bill was $30. From the start, Johnson was focused on producing a budget-conscious, high-end design. To do so, he chose less costly—but still authentic and locally sourced—materials that ended up creating texture and interest in the home. For instance, rather than use pricey solid-wood doors on the ground floor, he selected old wooden doors from Portland Architectural Salvage. “There’s something to using old stuff that adds a narrative to a building project that you just can’t get from brand-new stuff,” Johnson says. To define the downstairs central space, Johnson replaced the bearing walls with heavy wooden beams carried by heavy wooden columns and secured with steel brackets. A highly finished, kiln-dried Douglas fir beam or column might have cost the Snyders $400 to $600. The unfinished, wet, Maine-harvested hemlock beams and columns that Johnson used were about $80 each. “When you cut the beams, you literally get hit with water from the saw,” Johnson says. As the beams dry, they “check,” meaning the wood forms gaps, sometimes significant ones. For some this might have been a problem, but Johnson and the Snyders love the rough look and, perhaps, some of the experience of achieving it. “All winter, this house sounded like a bowl of Rice Krispies,” Kate says, referring to the sound of the drying wood. Despite the woodstove and hemlock, the house is not, as Kate says, “cabin-y.” It’s a modern home with plenty of natural light, thanks to the large windows and the glass doors that open onto defined outdoor spaces like the breakfast patio, front porch, and back deck. 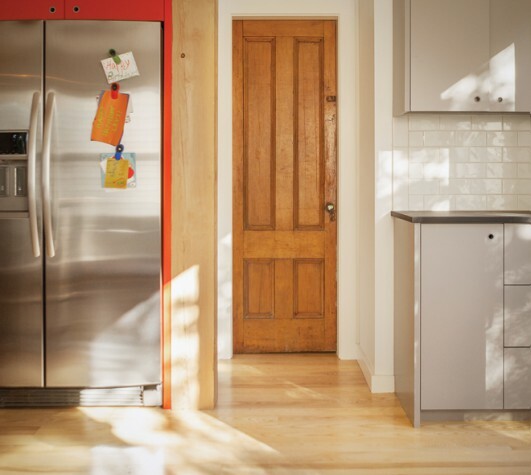 For the kitchen interior, Johnson collaborated with cabinetmaker Derek Preble of Biddeford to build slab-door cabinets with pulls fabricated by “slicing a steel pipe like a pepperoni,” as Johnson describes it. 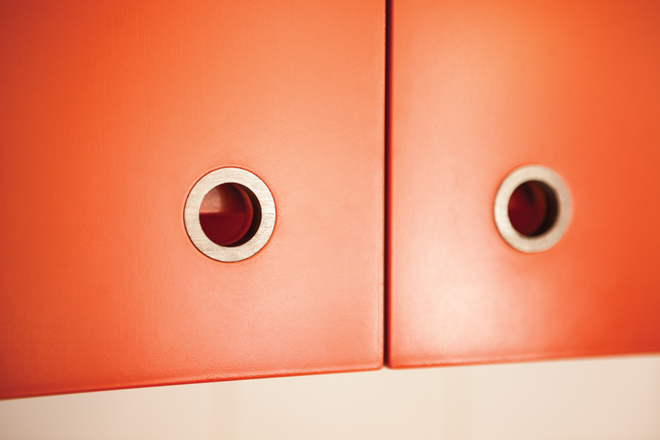 Because Kate loves color, some of the cabinets are orange. (The rest are taupe.) Stools from CB2 abut the center island, which is topped with an environmentally friendly product called Richlite. The pendant lights over the kitchen island are from Design Within Reach, as is a circular bamboo pendant light, whose repeating patterns are inspired by the shape of ice crystals and coral. It hangs over a round walnut table made by Gabriel K. Sutton of Biddeford. Johnson describes Bruce’s office as “the envy of everybody, including myself.” It is a long, narrow space, with a white pine, built-in desk running along one wall and built-in storage for CDs running along the other. Johnson designed a corner closet to accommodate Bruce’s guitar collection and finished the office walls in pickled pine. Johnson also used pickled pine and built-in storage for the mudroom, which has a bench, cubbies, coat closet, and wall hooks. To save money, these built-ins were assembled on-site by finish carpenter Ed Lavertu of Lavertu Construction in Portland. Upstairs, Johnson kept the existing roofline, while vaulting the bedroom ceilings and tucking closets and storage areas into several spots below the eaves. Outside, the existing rake and eave details were preserved, as were some of the original clapboards. The roof was replaced with a snaplock metal roof. The original porch was opened back up and floored with eastern white cedar, which was left unfinished to weather out over time. 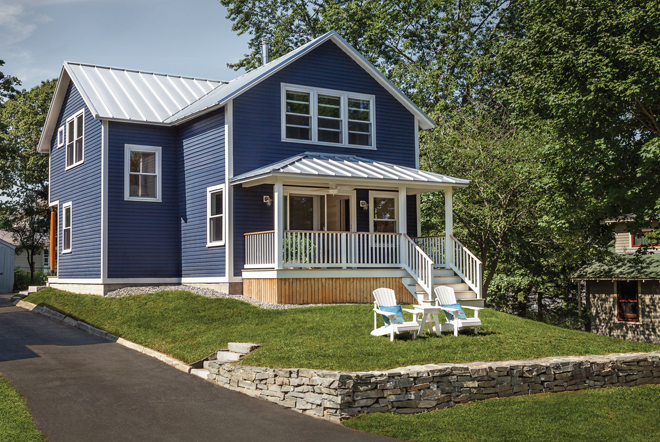 Although it is painted a rich blue, the exterior of the home is purposefully traditional, of a piece with the neighborhood’s New England aesthetic. There is, however, a hand-turned, reclaimed wood column anchoring one corner of the new entryway. Sleek, unusual, and richly hued, it surprises and serves as invitation: There’s more like this inside. Come see.